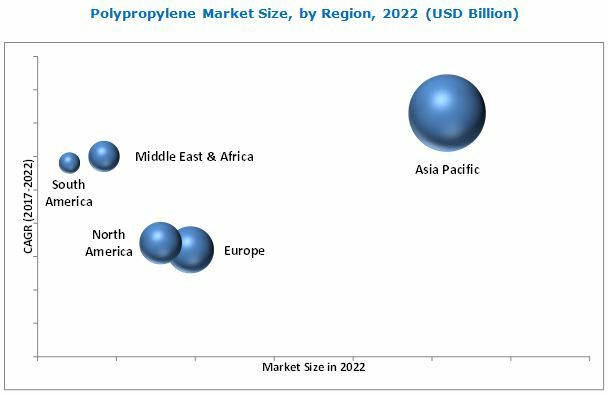 [154 Pages Report] Polypropylene Market size was USD 71.08 Billion in 2016 and is projected to reach USD 99.17 Billion by 2022, at a CAGR of 5.6% between 2017 and 2022. The base year considered for the study is 2016, while the forecast period is from 2017 to 2022. 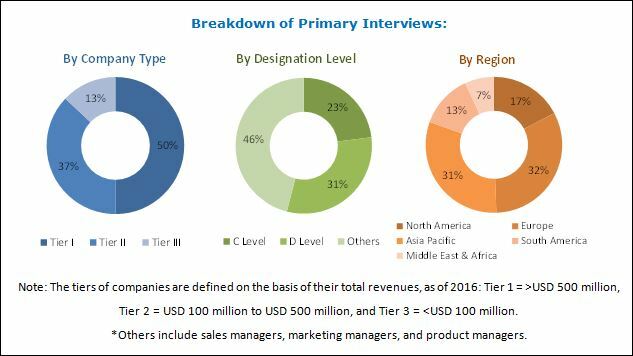 The top-down approach has been used to estimate and validate the size of the polypropylene market and to estimate the sizes of various other dependent submarkets in the overall polypropylene market. The research study involved the extensive use of secondary sources, directories, and databases, such as Hoovers, Bloomberg, Chemical Weekly, Factiva, and other government and private websites to identify and collect information useful for the technical, market-oriented, and commercial study of the polypropylene market. The supply chain of the polypropylene market starts with the sourcing of raw materials, followed by the manufacture of polypropylene, processing of polypropylene, and supply of finished polypropylene products, and ends with the use of polypropylene in various end-use applications. The major players in the polypropylene market are LyondellBasell (The Netherlands), SABIC (Saudi Arabia), Exxon Mobil Corporation (US), DuPont (US), INEOS (Switzerland), Total S.A. (France), Formosa Plastics Group (Taiwan), China Petrochemical Corporation (China), LG Chem (South Korea), and Sumitomo Chemicals (Japan). This research report categorizes the polypropylene market on the basis of type, end-use industry, and region. The polypropylene market size is estimated at USD 75.40 Billion in 2017 and projected to reach USD 99.17 Billion by 2022, at a CAGR of 5.6% between 2017 and 2022. Rising use of polypropylenes in injection molding, fiber & raffia, film & sheet, and blow molding; growing trend towards the use of polypropylene in the automotive industry to reduce the weight of the vehicle for increased fuel efficiency; and growing demand from Asia Pacific are projected to be the major drivers of the global polypropylene market during the forecast period. The polypropylene market is classified into two types namely, homopolymer and copolymer. Homopolymer is the most-widely used type of polypropylene, as it provides a high strength to weight ratio and is stiffer than copolymers. The excellent chemical resistance and weldability enable the use of the polypropylene homopolymer in many corrosion resistant structures. Homopolymers are characterized by a high isostatic index, resulting in high melting point, and thus are useful in applications requiring high temperature resistance, such as hot filling and steam sterilization. The common applications of the polypropylene homopolymer are orthotic and prosthetic devices, secondary containments, pump components, and storage tanks. By application, the polypropylene market is classified into four segments, namely, injection molding, fiber & raffia, film & sheet, and blow molding. Injection molding is the largest application of polypropylene in terms of volume. Polypropylene is melted in the injection molding machine and then injected into the mold, where it cools and solidifies into the final part. Owing to the properties of polypropylene, such as excellent moisture resistance, high impact strength and chemical resistance, it is majorly used in the injection molding application. The polypropylene market is classified into five end-use industries, namely, packaging, automotive, building & construction, electrical & electronics, and medical. Packaging is the largest end-use industry for polypropylene, owing to its properties, such as resistance to high temperature, flexibility, excellent optical clarity, and low moisture vapor transmission. Apart from this, polypropylene is safe for food packaging as it does not react with the food. It is a cost-effective medium for packaging compared to other materials, and is used for packaging in various industries, such as food, beverages, health care, cosmetics, and others. Asia Pacific is estimated to be the largest market for polypropylene and is also projected to grow at the highest CAGR during the forecast period. China is expected to account for the largest share of the market in the Asia Pacific till 2022 and is also expected to be the fastest-growing market for polypropylene during the forecast period. Major producers of polypropylene, such as Formosa Plastics Group (Taiwan), China Petrochemical Corporation (China), LG Chem (South Korea), and Sumitomo Chemical (Japan) are in the Asia Pacific. Europe accounts for the second-largest share of the global polypropylene market. The availability of other polymers, such as PE, PS, PET, and others provide stiff competition to polypropylene, and acts as a restraint for the polypropylene market. Apart from this, growing environmental concerns over the disposal of plastics also acts as a restraint to the polypropylene market. Companies are majorly adopting the expansions strategy to increase their market shares to cater to the increasing demand for polypropylene products. For example, in 2017, LyondellBasell started a new 20 kiloton per year polypropylene compounding plant in Dalian, China. Through this expansion, the company aimed to serve the demand from China’s growing automotive market. Companies, such as LyondellBasell (The Netherlands), SABIC (Saudi Arabia), Exxon Mobil Corporation (US), DuPont (US), INEOS (Switzerland), Total S.A. (France), Formosa Plastics Group (Taiwan), China Petrochemical Corporation (China), LG Chem (South Korea), and Sumitomo Chemicals (Japan) adopted expansions, new product developments, and agreements strategies to expand their market shares and product portfolios in the polypropylene market between 2014 and 2017. 11.1 Lyondellbasell Industries Holdings B.V.
11.18 Lotte Chemical UK Ltd.